This show was just so much fun. 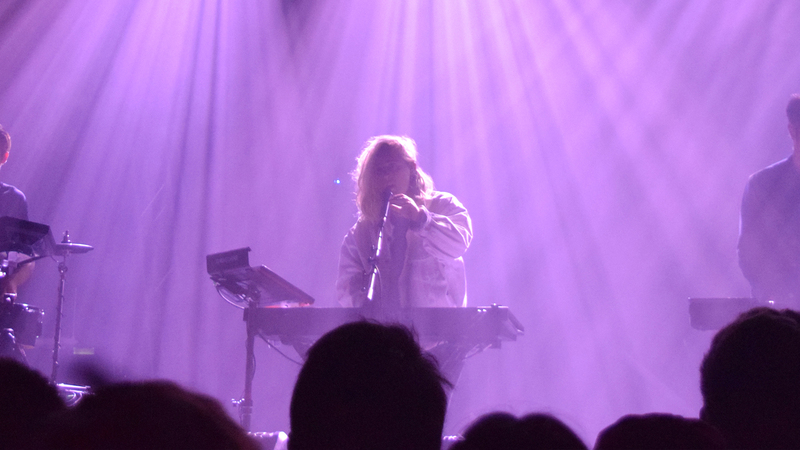 When the first notes of Shura’s “Nothing’s Real” rang out at Terminal 5 in New York City during her opening set for M83 last Friday, the crowd was immediately hooked. The electropop musician made it clear right away that she wasn’t going to hold anything back while rocking out onstage in an oversized jacket and beanie. For long-time fans of Shura, it was exactly what they were hoping to see; for those getting to experience her talent for the first time, it was an awakening. Two songs into her set, the singer-songwriter-producer charmed the crowd with her British accent and witty comments, all the while shyly thanking her screaming fans. Armed with a synthesizer and microphone, as well as drummer Ally Wilkinson and guitarist Luke Saunders, she pounded out songs from her EP, Nothing’s Real, losing her hat in the process. As much as she was whipping her hair around, it was a wonder that she hadn’t lost it sooner. Every song felt like a standout with the crowd getting progressively more excited as she abused her synth and chatted with us like we were a group of friends jamming in her bedroom. She even jumped off the stage during “Touch”. When the song was over, she yelled, “Thanks for touching me!” and proceeded to tell us a story about getting tackled by security when she jumped into the crowd at another show. Shura just seemed so genuine and fun, and it was so infectious. As her set came to a close, the “White Light” singer pounded so hard on her synth that she broke it, and the crowd loved it. It was one hell of a show, and one that proved that this artist is here to stay. Check out our photos and make sure to Track Shura on Bandsintown so you don’t miss out next time she’s in a city near you!